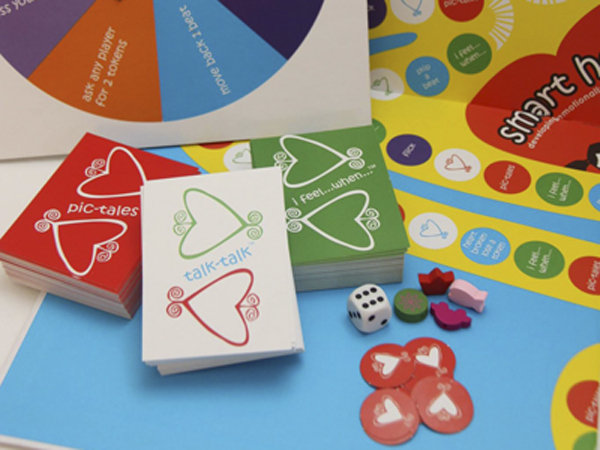 Smart Heart is a revolutionary board game that encourages emotional expression in children. It is an interactive game, which makes use of pictures and word cards that assists children in identifying and communicating their feelings. Christine Kritzas and Janet Bytheway, two psychologists from Cape Town, developed the game with the aim to encourage children to think for themselves and create solutions to their problems. The board game is a tool for teachers, parents, psychologists, occupational therapists or anyone working with children, says Bytheway. Children between five and 13 can use Smart Heart to confront serious issues in a playful manner, creating a safe environment where they’re comfortable to speak about things that happen on the playground, in the classroom, with friends and at home. - What do you like about your school? - If a girl is playing by herself at break, how could you include her in your game? - Describe a time when you felt the emotion portrayed on the card. Smart Heart can be a great way for teachers to encourage emotional development and expression in the classroom. You can order Smart Heart at a cost of R399.